I am a retired Detective from the Juneau Alaska Police Department, and currently on the Alaska Governor Security Detail. I was both shocked and saddened to hear of Berke’s death. I first met Berke about 5 years ago in Austin, Texas while attending the Texas DPS Dignitary Protection school. At that time Berke was assigned to the Governor Detail with SC Troopers. I instantly liked Berke, as his sense of humor was unique and appealed to my nature. (At the training Berke had nicknamed me “Baked Alaska” due to the 110 degree heat). I grieve for your loss and wish I had the words to better express my heartfelt condolences. Be assured Berke is fondly remembered and missed all the way up in Alaska. I was both shocked and saddened to hear of Burke’s death. I first met Burke about 5 years ago in Austin, Texas while attending the Texas DPS Dignitary Protection school. At that time Burke was assigned to the Governor Detail with SC Troopers. I instantly liked Burke, as his sense of humor was unique and appealed to my nature. (At the training Burke had nicknamed me “Baked Alaska” due to the 110 degree heat). I grieve for your loss and wish I had the words to better express my heartfelt condolences. Be assured Burke is fondly remembered and missed all the way up in Alaska. On behalf of my family, I extend our sincerest condolences on the grievous loss you suffered when Berke was killed. To the Bates family, fellow officers, and all who call Berke beloved, my heart goes out to all of you and may you find comfort in your loved ones and your strength in your faith. When my son was killed, the entire law enforcement community in our area embraced us in a circle of love and support, and I know you will receive the same support. It makes the unbearable less torturous, and I pray for your solace. I hope that your family knows that a nation mourned for you. Berke was a good man; funny and full of life. He graduated ranked 1st in the 107th Basic Trooper Session, where I first met him. I'm proud to have worked along side him. God bless you, Berke. Thank you for your dedicated service to your community and to your department. May the Lord bless you and keep you. May they never forget your faithful service to your community and department and the brave HERO that you were. To Mrs. Bates, children, family, friends and co-workers, our heartfelt prayers and sympathies are with you now and forever. May God be with you all during this very sorrowful time. Words will never compensate the loss you have suffered. We pray that He now gives you all strength in your time of need. May you find peace in the thought, that we as friends in law enforcement, take this time to lift you up in prayer. For your act of unselfish bravery and courage Trooper Pilot Bates, we salute you. Blessed are the peacemakers. My family and I would like to extend our sincere condolences to the family, friends, and fellow coworkers of Trooper Pilot Berke Bates during this very difficult time. May they find comfort and support from those around them. May their times spent together bring forth happy memories to last a lifetime. May God help heal their aching hearts. Thank you for your service and dedication to your community. 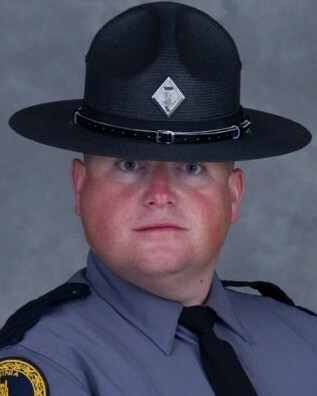 Rest in peace Trooper Bates. I have lifted your family to God every morning for over six years. I pray that Berke's life and death will bring glory to His name. Rest In Peace brother. From your BLUE family at Palm Bay Police Department. Rest in Peace Trooper Bates. Thank you for your service. My thoughts and prayers are with the Bates Family and the Virginia State Police.